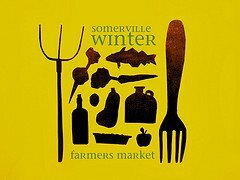 The Somerville Winter Farmer's Market continues tomorrow from 9:30am to 2pm at the Armory (191 Highland Avenue). Stop by for fresh produce, meats, fish, and more supplied by local vendors! There is parking in the back of the Armory and along Highland Avenue for shoppers. Also, don't forget that the Armory Cafe is now open and has food, drinks, and free WiFi. It boasts local coffee, coffee-based drinks, beers, wine, soups, sandwiches, and desserts. So, be sure to have breakfast or lunch before or after doing your shopping at the market. The market is scheduled to run from December to April 13th!